The "MrFred Harness" is the same as the regular SD Harness, but adds an extra foot long harness for Active Baro support through the use of your stock MAP Sensor. The "EDM/JDM Harness" is for European or Japanese model Evos that did not come with a MAP sensor from the factory. 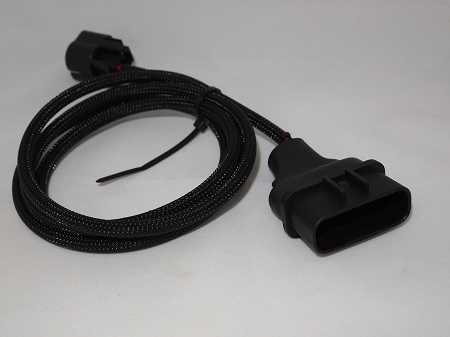 It adds a connector for a GM Style MAP Sensor or Stock Style MAP Sensor. You simply swap Pin 51 (Barometer) to Pin 92 (MAP) and follow the directions below. Installation of the GM IAT sensor into the intake manifold. "SD Option: IAT Input for MAT - Use 0x03, Fuel Temp ADC_0E for MAT - Use 0x0E"
Default setting is 0x0E, you must change this. Installation of an aftermarket or JDM MAP Sensor. Tephra v7 must be installed and tuned. This is no easy feat!